After a busy few days in Ronda, our plan was to tour the white villages back towards the coast. Unfortunately the weather was taking a turn for the worse again with tumbling temperatures and rain predicted in the hills. Plans were quickly changed and we felt the call of the coast again for some sunshine and headed straight back towards the sea. We headed towards Estepona, a large resort town on the Costa Del Sol which has managed to retain its old pueblo feel, despite being a big tourist attraction during the summer months. Surprisingly we managed to drive directly to the marina car park without a single wrong turn by the satnav. Then we went for our customary reccie to get our bearings. Supermarket – check, cafes/restaurants – check, old town to explore – check. It’s looking good (36.4147, -5.1609). Walking along the palm-lined promenade, we made our way towards the town. The promenade runs alongside the long beach but the main road on which it is located is rather uninviting. The shopping area and old town starts one street back, off the far end of the promenade. 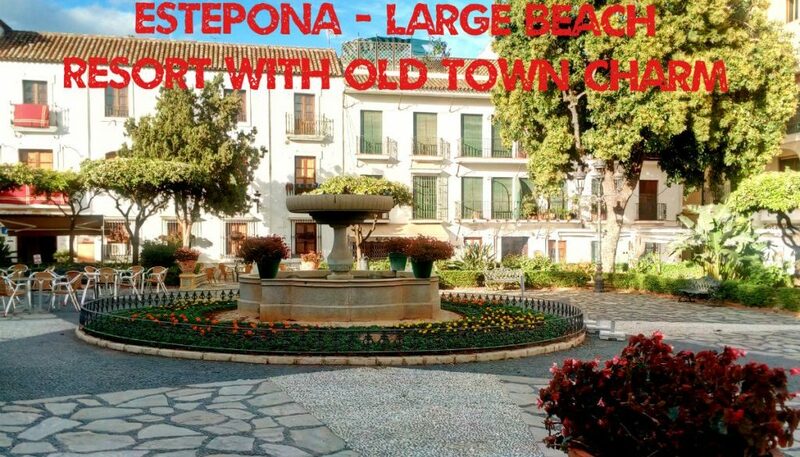 Estepona old town is obviously loved by both its residents and the local council. Each street is decorated with different coloured flower pots and baskets, from royal blue to cerise pink, contrasting with the whitewashed walls of the houses. A single colour of pot is used in each street – giving each street its own identity. The paved and cobbled streets lead to the Plaza de la Flores. Walking towards the square, the air is filled with the scent of orange trees and jasmine, then a beautiful flower-filled square surrounded by cafes and restaurants opens up before you. It is difficult to describe just how strong the sweet smell of flowers is as you approach the plaza. I imagine the square is a hive of activity in the summer months but in March we were lucky enough to have most of it to ourselves. Being able to sit in the spring sun and watch the world go by, I still can’t believe this is our life, that we can go anywhere we want, stay as long we want with no timetable. We are so lucky. Behind the Plaza de Flores, the streets get even narrower and prettier and wind their way to the church of Nuestra Señora de Los Remedios in the Plaza San Francisco. Walking back along the promenade we noticed gardeners and council workers planting the flower beds and trimming the palm trees, getting ready for the Easter visitors in a few weeks. Hopefully the weather will be warmer by then. We spent three nights in the Marina Car Park before we headed off towards Casares, one of the white villages in the mountains above the coast that we had earlier postponed our visit to. You must have worked hard, so you desreve it! How beautiful, Estepona, another one on the list! Thanks Chris & Peter. I much prefer to visit an area surrounded by beautiful scenery, architecture, history or charm. Estepona is indicative of all of the Costa del Sol. It started life as a small fishing village and has expanded to be a concrete conurbation, so you have to go searching for the original charm, but worth it in the end. Casares was great, but with the cooler damp weather I ended up with a chest infection which held us back for a week. Our blog is still about a month behind …. (well there are always other things to do!). We are currently sitting in the Algarve and it is cool wet and grey here too. I hope Ollie feels better soon and is rearing to go! Enjoy Germany and beyond. Beautiful look at Estepona and gorgeous photos! Thanks Ruth. The old town was worth seeing….. the rest just part of the concrete jungle of the Costas. Thanks for your article. We have been to Estepona many times and love it. We used to live a little bit up the coast from Estepona yet never got to explore it. Finding the old town was a revelation and it was made even better by getting some of the best tapas we have had in a little side street bar. We would definitely return to it again.